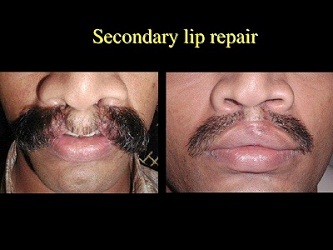 Surgical Lip Repair-Craniofacial cochin-The Comprehensive Solution for all Craniofacial Problems. A cleft lip does not join together (fuse) properly during embryonic development. Surgical repair corrects the defect, preventing future problems with breathing, speaking, and eating, and improving the person’s physical appearance. Most cases of cleft lip have no known cause. However, there is a strong genetic correlation. Other single gene defects that are associated with cleft lip include: Van der Woude syndrome, Opitz Syndrome, Aarskog syndrome, Fryns syndrome, Waardenburg syndrome, and Coffin-Siris syndrome. Approximately 5% of cleft conditions are associated with a genetic syndrome. Most of these syndromes do not include mental retardation. Facial cleft has been implicated with maternal exposure to environmental causes, such as rubella or medications that can harm the developing embryo. These medications include steroids, antiseizure drugs, vitamin A, and oral anti-acne medications (such as Acutane) taken during the first three months of pregnancy. Cleft lip is also associated with fetal alcohol syndrome and maternal diabetes. Risk of cleft lip increases with paternal age, especially over 30 years at the time of conception. Generally, the risk is higher when both parents are over 30 years of age. However, most cases seem to be isolated within the family with no obvious causation. When the affected child has unilateral cleft lip and palate, the risk for subsequent children increases to 4.2%. Advances in high resolution ultrasonography (prenatal ultrasound exam) have made it possible to detect facial abnormalities in the developing embryo (in utero). While the patient is under general anesthesia, the anatomical landmarks and incisions are carefully demarcated with methylene blue ink. An endotracheal tube prevents aspiration of blood. The surgical field is injected with a local anesthestic to provide further numbing and blood vessel constriction (to limit bleeding). Myringotomy (incisions in one or both eardrums) is performed, and myringotomy tubes are inserted to permit fluid drainage. 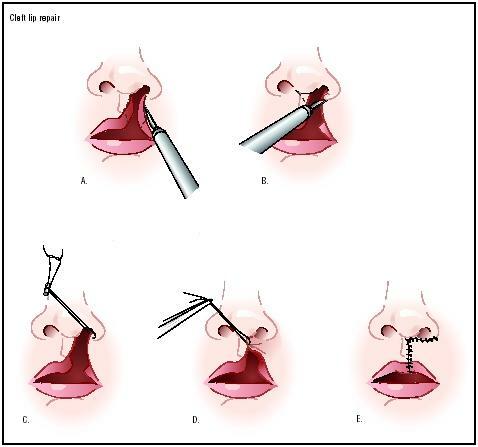 There are several operative techniques for cleft lip reconstruction. The Millard rotation advancement (R-A) technique is the most widely accepted form of repair. This method involves rotation of the entire philtral dimple (groove in the upper lip) and Cupid’s bow (double curve of the upper lip). The scar falls along the new philtral column (central section of the upper lip), and is adjusted as required since the procedure allows for flexibility. – It is the most common procedure (i.e., surgeons more familiar with it). – The technique is adaptable and flexible. – It permits construction of a normal-looking Cupid’s bow. – A minimal amount of tissue is discarded. – The suture line is camouflaged. The disadvantage of the Millard rotation advancement technique is the possible development of a vermilion notch (shortening of the entire lip in the vertical direction), resulting from contracture of the vertical scar.Cupid’s bow is a critical part of the repair, making it very important to accurately determine the high point of Cupid’s bow on the lateral lip. The edges of the cleft between the lip and nose are cut (A and B). The bottom of the nostril is formed with suture (C). The upper part of the lip tissue is closed (D), and the stitches are extended down to close the opening entirely (E).